Nissan is hyping up what it may do in regarding of its concept car Esflow. Esflow is taunting with 150 miles range. It’s a car that fully powered by electric and using lithium-ion battery. This is a beast in shape and speed. In shape, it’s very sporty. According to Yahoo Auto, Esflow looks very much like 370Z. I don’t know about you, but I think 370Z is sporty as it gets, but Esflow may look even sexier. In speed, Nissan promises Esflow with 60mph in 4 seconds, a little less or more. Check out this beast at here. Personal point of view: I think they need to come out with a car that can go further than 150 miles range. For me, it will be very inconvenient for a car owner to recharge the car at every 150 miles range. 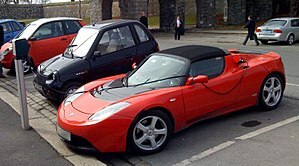 Hybrid has the advantage over electric car for now since I don’t have to worry about being stuck somewhere on the road as gas stations are to be found everywhere — having the best parts of both worlds since electric battery is allowing the gas powered car to save gas and go further. Talking about worrying less of refilling the gas tank and not having to recharge the car’s electric battery at all.